Crude prices easing back towards the low $60’s BBL range dampened the outlook for Russian energy majors, with Nymex and Brent crude futures trimming more than 1% in Friday trade on renewed concern that a faltering U.S. economy will hit demand in the worlds largest oil consuming economy. In Russia that translated into minor gains for Rosneft (up 2.6% on the Micex), Lukoil (up 5%) and GazpromNeft (up8.5%), along with a 2% gain for Gazprom. Norilsk Nickel gained 13% with Raspadskaya up 10%. Polyus Gold lost 2.1% with gold falling on global markets, and steelmakers MMK (up1.6%) and Severstal (up 1.5%) gained, while counterpart NLMK (down1%) closed lower. VTB (down 0.95%) and Sberbank (down 3.2%) closed lower, while RusHydro added more than 4%, with Kamaz adding 8%. In the retail and consumer goods sector Magnit (up 6.3%) and Wimm Bill Dann (up 11.7%) gained, while Sedmoi Kontinent (down 25%) and Dixy (down 10%) closed lower. 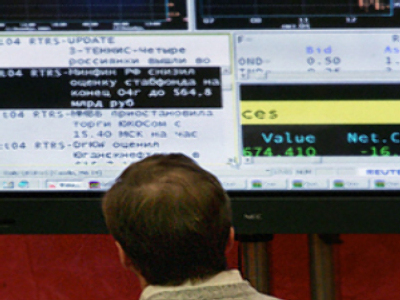 The Russian trading day came after Asian markets had posted falls on renewed concern about the U.S. economy. In Tokyo the Nikkei lost 5% despite the Bank of Japan trimming its key interest rate from 0.5% to 0.3%, and the Hang Seng closed 2.5% down. In London investors were similarly hesitant with commodity prices resuming their downward trend on the back of a resurgent U.S. dollar, and a profit warning from BT adding to the gloom, with Barclays capital raising not impressing, before resources rebounded mid afternoon. In Mid afternoon the FTSE 100 was up 0.5% with Tullow oil higher and BT and Barclays leading the falls. On the continent the Cac 40 was 0.6% higher mid afternoon with Axa and L’Oreal down and Credit Agricole up. In Frankfurt the Dax was more than 2% higher, Mid afternoon with BASF and Bayer up, and Allianz and Commerzbank down.